Unyon ng mga Manggagawa sa Agrikultura (UMA Pilipinas) is the national progressive center of unions, federations, associations and organizations of agricultural workers in the Philippines. 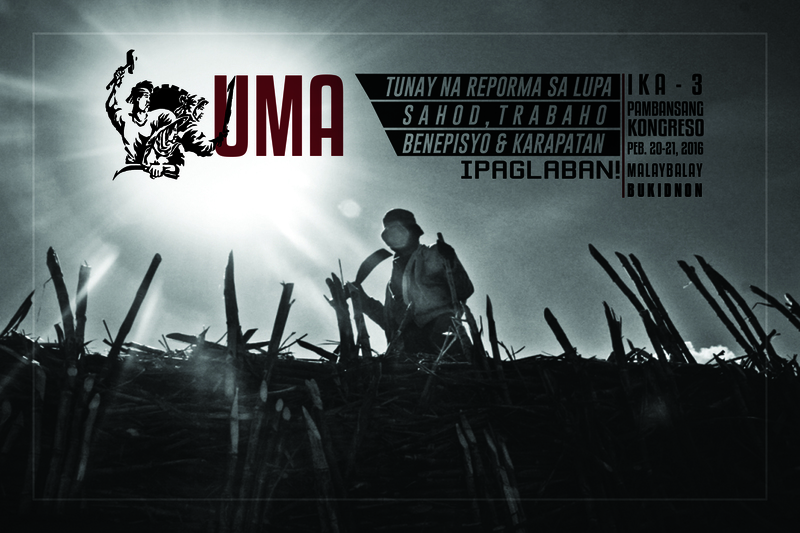 UMA works closely with other progressive people’s organizations in the Philippines such as the militant Kilusang Magbubukid ng Pilipinas (KMP, Peasant Movement of the Philippines), Kilusang Mayo Uno (KMU, May First Movement), and other organizations affiliated with the umbrella group Bagong Alyansang Makabayan (BAYAN, New Patriotic Alliance). The Unyon ng mga Manggagawa sa Agrikultura (UMA) and its member organizations, joined today the national and global day of protest to demand justice for the 14 farmers killed in Negros Oriental and other farmers killed in the whole country as well. According to Antonio “Ka Tonying” Flores, chairperson of UMA, this is the first time that such a coordinated action of protest actions against killings of farmers has been organized against the US-Duterte regime. Ka Tonying added that this is a clear message from the national and international communities that they are fed up with the gross human rights violations perpetrated by the US-Duterte regime against its own people. Some of the protest actions have already started. Protest actions called, “No Justice, No Peace, Stop the Killings in the Philippines!” were held inside the Hart US Senate Office Building and in front of the Capitol building in Washington DC on April 8. This was organized by the MALAYA: US Movement Against Killings and Dictatorship and for Democracy in the Philippines. In Sydney, Australia a protest action was held in the Philippine Consulate on April 9 by the Philippines Australia Union Link (PAUL), Migrante Australia, and Movement Against Tyranny (MAT) – Australia. Similar protest actions are being held in various countries as well which was called by the International Coalition for Human Rights in the Philippines (ICHRP). Even as a National Fact Finding Solidarity Mission (NFFSM) had been concluded in Negros Oriental on April 8 and its findings revealed to the general public that the farmers were summarily executed, military operations continue in Sitio Agho and Sitio Manggapa, in Masulog 1, Canlaon City. Fifty troops from the RMF 2nd Maneuver Battalion with their local intelligence assets are operating in said area and are still conducting the much dreaded, Synchronized Enhanced Managing of Police Operations (SEMPO) or Oplan Sauron. This has only been implemented so far in two places in Negros Oriental, in Guihulngan City from Dec. 26-27, 2018 which resulted to six summary executions and on March 30, 2019, which resulted to 14 summary executions. Other than that, military operations are being conducted in Northern Negros Occidental since the Sagay massacre on Oct. 20, 2018. The Philippine National Police, Armed Forces of the Philippines, and President Duterte, on the other hand, continue to blame the Sagay Massacre on the New Peoples’ Army (NPA), while claiming that all those who were summarily executed during the SEMPO fought back. This is not acceptable to the local and international community. Instead, UMA in coordination with other organizations are not only calling for justice to all the killings of farmers in Negros and in the whole country as well, but also to call on the military and PNP combat troops to go back to the barracks. Other than that it is calling on PNP Chief Oscar Albayalde to tender his resignation for command responsibility of the SEMPO operations in Negros Oriental and for whitewashing together with Malacañang the Sagay massacre. The US-Duterte regime should also be ousted for intensifying repression mainly against farmers in the countryside. Like Marcos, Duterte is just a paper tiger. Despite being more brutal than Marcos, he should not underestimate the growing movement to oust him locally and internationally. The Unyon ng mga Manggagawa sa Agrikultura welcomes the House Resoultion filed by the Anakpawis Partylist and fellow legislators in the Makabayan bloc for an independent and in-depth investigation on the mass killings of 14 farmers in Negros Oriental last March 30. In a press briefing, Albayalde dismissed allegations of any irregularities in the conduct of its Synchronized Enhanced Managing of Police Operations (SEMPO) or Oplan Sauron, citing that the operations were covered by search warrants and the killings resulted from the victims’ resisting arrest. Meanwhile, Año accused progressive organizations that are calling for justice of making alibis for the victims to place the government in a bad light. However, he plays dumb when confronted with the fact that victims, whom they claim died from an encounter, have been shot at close range. This is consistent with the accounts of victims’ family members who have witnessed the summary execution of their loved ones right in their very homes. Año runs against logic as he reiterates the “nanlaban” narrative to the public implying that all 14 farmers opted to get into a shootout with more than 20 state forces carrying high-powered weapons. Meanwhile, family members recounted how the victims held up their hands before they were shot to death. “Where can people, especially poor farmers, run for justice when the very agencies tasked to serve and protect them are the ones killing them and their loved ones, while the very institutions that are expected to hold in check abuses of power have not only turned a blind eye, but even acted as their protectors? It is not surprising that residents terrorized by the mass killings done by the PNP and AFP have left their homes and have chosen to sleep in the middle of sugarcane plantations and other people’s houses,” Flores added. The President defended the mass killings through Presidential Spokesperson Salvador Panelo knowing that this is his own handiwork when he issued Memorandum Order 32, which placed Negros, Samar and Bohol under a “state of emergency” and deployed thousands of state forces in the said areas. UMA reiterates its call for an independent thorough-going probe into this tokhang-style police operation. Besides the CHR’s investigation, the independent body, composed of national and international human rights organizations, should conduct its on-site inquiry on the vicious killings perpetrated by state forces. The Unyon ng mga Manggagawa sa Agrikultura (UMA) today denounced Presidential Palace spokesperson, Salvador Panelo, for prejudging the latest killings of 14 peasants by state security forces in Negros Oriental on March 30. According to Antonio “Ka Tonying” Flores, Chairperson of UMA, this is the second time that the Palace prejudged such dastardly acts in Negros. The first time was when it only re-echoed the police and military’s version of the Sagay massacre which occurred on October 20, 2018, even when its investigation was not yet finished. The Palace cleared the police and the military for the crime even if Philippine National Police Chief Oscar Albayalde supposedly said he is open to an investigation of this latest series of killings. Ironically, Mr. Panelo is supposedly a lawyer by profession. As such, UMA is urging congress to investigate the killing of 14 farmers by supporting Anakpawis Partylist and Makabayan bloc’s filing of a house resolution to conduct a Congressional inquiry on the incidents. UMA also welcomes the Commission on Human Right’s (CHR) pledge to conduct its own probe on these. Why were the supposed search warrants served after midnight? Why were most of the members of the PNP and military who served said warrants wearing facemasks and other paraphernalia to conceal their identities? The probe should also look into the judges who issued the search warrants and members of security forces who took part in the said military operation, especially those involved in the killings. If this will not be done, the so-called Synchronized Enhanced Managing of Police Operations (SEMPO) or Oplan Sauron, which is now being experimented in Negros Island can be replicated nationwide, especially as President Duterte becomes more tyrannical in his rule. The Unyon ng mga Manggagawa sa Agrikultura (UMA) today claimed that Philippine National Police (PNP) chief Oscar Albayalde is lying on the killing of 14 persons in Negros Oriental. Essentially like the Sagay massacre and Guihulngan killings, the PNP General is whitewashing the March 30 killings in said province. According to Antonio “Ka Tonying” Flores, chairperson of UMA, the PNP chief has taken the word of Negros Oriental Provincial Police Office head Colonel Raul Tacaca hook, line and sinker, without investigating first on what transpired during the police and military operations in Canlaon and nearby towns in Negros Oriental. Especially as witnesses to the killings have come out openly debunking the claims of the PNP as to what truly transpired during said operations. A case in point is the killing of Franklin Lariosa in Santa Catalina town. According to Karapatan – Negros witnesses claim that he was shot at by state security forces while reading the search warrant given to him. After he was killed, his killers confiscated campaign materials of Neri Colmenares, Gabriela, Anakpawis and Bayan Muna party lists. Franklin was the chairperson of Piston -Talalak Chapter. He was also a member of Talalak Farmers Asso (TUFA) and campaigner of Makabayan. On the killing of Ismael Avelino, 6 armed men knocked and kicked open their front door at around 2:30 am while they were sleeping. The 6 wore camouflage uniforms and all were wearing face masks to cover their faces. They ordered Ismael’s wife and their children to lie face down and then they were dragged outside of their house. After which they heard 3 gunshots but were not allowed to enter the house until an ambulance took away Ismael’s cadaver to the Canlaon District Hospital. Other witnesses have also come out on the killings of Edgardo Avelino and of Steve Arapoc, which have come out in the press. With regards to the illegal arrest of Anakpawis partylist coordinator Azucena Garubat, around 15 armed men surrounded their house at around 3 am of March 30. They were told by 4 persons who identified themselves as CIDG personnel that they had a search warrant for a .45 caliber pistol. After searching for around 30 minutes they were brought outside the house and were threatened not to speak and at around 6 am, the CIDG allegedly found two grenade launchers inside her violet sling bag. UMA is thus reiterating its call for an independent impartial investigation on the said case. It welcomes the statement of the Commission on Human Rights (CHR) to investigate the recent killings in Negros Oriental. In the meantime the PNP and military should inhibit themselves in these investigations. PNP Chief Albayalde had also whitewashed the Sagay massacre which occurred earlier on October 20, 2018 and blamed instead the New Peoples Army (NPA) and even the National Federation of Sugar Workers (NFSW) in perpetuating the massacre. He is unfit to become the chief of police and should resign from his post. The Unyon ng mga Manggagawa sa Agrikultura (UMA) today demanded that justice be given for the killing of 14 peasants in three towns in Negros Oriental yesterday due to state terrorism. According to Antonio “Ka Tonying” Flores, newly elected chairperson of UMA, the deaths of the 14 is similar to what happened in Guihulngan and nearby places late last year in which six peasants were killed ala “tokhang style” because they allegedly fought it out with police and military elements. We call on the Governor, the Commission on Human Rights (CHR) and other independent bodies to call again for an impartial investigation in the killings of the 14 peasants. The 14 who were killed yesterday include 8 farmers from Canlaon City: Avelino brothers Ismael, 53, and Edgardo, 59, of Sitio Carmen, Barangay Panubigan; Melchor Panares, 67, and his son, Mario, 46, of Sitio Tigbahi, Barangay Bayog; Rogelio Recomono, 52, and his son Ricky, 28, of Sitio Manggata, Barangay Masulog; Gonzalo Rosales, 47, of Barangay Pula and Genes Palmares, 54, of Barangay Aquino. Edgardo Avelino was the chairman of HUKOM or Hugpong Kusog sa Mag-uuma sa Canlaon City, a local chapter of the national peasant group, Kilusang Magbubukid ng Pilipinas (KMP). Aside from the killings, authorities also illegally arrested around 12 other farmers, including Nestor Kadusale, 58, of Sitio Kambugtong, Barangay Bantolinao, also a local leader of the KMP in Manjuyod town. Four of those killed in Manjuyod included two barangay captains: Valentin (“Eric” in police report) Acabal of Barangay Kandabong and Sonny Palagtiw of Barangay Panciao; and two farmers, Steve Arapoc and Manulo Martin. Two others were in killed in Sta. Catalina town, were identified as Franklin Lariosa and Ano Enojo Rapada. The perpetrators of the massacre include the Philippine National Police (PNP)-Region 7, its Special Action Forces (SAF) and Regional Mobile Force (RMF), along with elements of the 94th Infantry Brigade Philippine Army. They conducted a similar anti-crime synchronized enhanced management of police operations or SEMPO like what they did in Guihulngan earlier. The whole Negros Island was also placed under a state of lawlessness through Memorandum Circular 32 by President Duterte after the Sagay massacre. It seems though that it is the PNP and the military which is conducting a state of lawlessness against the people of Negros. Besides the massacres in Canlaon, Guihulngan and Sagay, police and military operations are continuing in Northern Negros Occidental, which includes Sagay and Escalante. There are also reports that the SEMPO will also be launched in Escalante City as the police allegedly have already a list of 100 individuals to be arrested there soon. More than 70 individuals, mostly peasants have been extra-judicially killed in Negros during Duterte’s term. We cannot blame the peasant masses of Negros if they seek justice elsewhere if this government will continue to trample on their rights with impunity. The Unyon ng mga Manggagawa sa Agrikultura (UMA) today said that the Department of Agrarian Reform (DAR) deliberately made sure that the Lorenzo-Cojuangco-Aquino owned Central Azucarera de Tarlac (CAT) agricultural lands would be exempted from land reform. Then OIC DAR Secretary Rosalinda Bistoyong on Nov. 28, 2017 made the eventual decision on this when she approved the application by CAT for exemption from land reform. A few months after this was certified final and executory by DAR Bureau of Agrarian Legal Assistance (BALA) Director Maria Celestina Tam on Feb. 6, 2018. Immediately or less than 2 months after or on April 4, 2018, the CAT sold 290 hectares (has. )of the exempted 424.4862 has. land to Ayala Land, Inc. But earlier on this, DAR ignored the April 24, 2012 decision of the Supreme Court to find other agricultural lands that would be subjected to land reform especially in areas owned by CAT. It had to wait for it to be subjected to a Petition for Coverage. It only agreed to include Tarlac Development Corp. (TADECO) lands in barangays Balete and Cutcut when the residents asserted their right to own it even when they were subjected to many violent dispersal operations by the police and goons; some were illegally arrested and detained; and many of them were charged with several criminal offenses. But it remains officially undistributed up to the present and then DAR Sec. Rafael Mariano junked TADECO’s bid to exempt it from land reform during his term in office. Going back to CAT lands, on February 18, 2019, it informed 800 households to vacate their domicile and demolish their dwellings and any infrastructure that they had erected or face legal action after 60 days of the sugar mill’s notice. The residents of the 60.47 hectares property which the CAT wants to repossess is populated by field and mill sugar workers, factory workers, retired workers and informal workers. A number have stayed there for more than 50 years and have invested their homes there. According to John Milton Lozande, secretary general of UMA, there are also many questions on the contents of the Nov. 28, 2017 DAR Order exempting CAT from land reform. Other than that, there was a report by DAR to the Supreme Court that it distributed lands in Brgy. Central. 1. Most of the lands that CAT admits it owns in its annual report and which is supposedly agro-industrial in nature state that these are idle lands. 330 has. are declared not used for business and operation, and another 202 has. are held for sale and development thru its subsidiary Luisita Land Corporation (LLC). Under the Comprehensive Agrarian Reform Program (CARP) converted lands left idle after 5 years, should be returned to DAR for distribution. What was sold to Ayala was part of the 330 has. of land. Other than that, from our data, there are 382.5451 has. owned by CAT in different areas and not just the 202 has. which CAT admits in its annual report. 3. There are inconsistencies in the DAR Order, on p. 4, the PARPO Certification issued by Eng. Precy Landingin, PARPO I/Head dated 6 Jan. 2017 stated that “no actual occupants in the area is observed”. 4. CAT’s notice is contrary to DAR’s order which stipulates that disturbance payments should be given to tenants, farm workers, or bonafide occupants. 5. As such it is a violation of DAR’s order which also stipulates that it can cancel or withdraw the order for misrepresentation of facts as what it did when it issued out its Notice for eviction on Feb. 18, 2018. But more than the above, President Duterte supposedly distributed Certificate of Land Ownership Awards (CLOA) in Hacienda Luisita recently, but in fact, people are being evicted from their lands by the Lorenzos-Cojuangcos-Aquinos with the President’s blessings. The National Federation of Sugar Workers (NFSW) today asserted that the Philippine National Police (PNP) admitted lying from the start in its narrative of the Sagay Massacre. This is supported by the reply affidavit of the mother of a Sagay massacre child survivor when she filed this today at the Department of Justice (DOJ) in Manila. She was assisted by her lawyer, Atty. Katherine Panguban of the National Union of Peoples’ Lawyers (NUPL), who is facing kidnapping and serious illegal detention charges. According to John Milton Lozande, secretary general of NFSW, it is clearly shown in the Counter-Affidavit and Supplemental Counter-Affidavit submitted by the respondents, including from the sworn statements of their witnesses, that they admitted that they violated the rights of the child massacre survivor by tampering with his affidavit. Then Sagay PNP Chief PCINSP Robert Mansueto admitted in his Counter-Affidavit that he added the contents of the statement of the child survivor that the latter saw some of those who shot them, even if this was denied by the child in his sworn statement of October 30, 2018. This revelation was not also denied by SPO1 Julie Ann C. Diaz in her own counter-affidavit. The NFSW supports the child’s mother in her reply affidavit that this is a clear indication that the police has no desire to reveal the truth and they abused the child by forcing him to lie in court and to the public. The mother, who we cannot name for security reasons, initially charged Sagay City’s PCINSP Robert R. Mansueto, SPO1 Julie Ann C. Diaz and PO1 Christine Y. Magpusao with Child Abuse and Rule on Handling Child Witness. At the same time, she also charged her estranged ex-husband with Violence Against Women and their Children for continuously intimidating and harassing her and her child. In the meantime, President Duterte made a propaganda stunt on his own by distributing Certificates of Land Ownership Awards in Sagay last March 8, while at the same time holding on to the PNP’s discredited narrative of the incident. The President is using the previous bogus land reform law to deflect the growing discontent of the farmers and sugar workers against land monopoly specially in Negros and other flash points in the country while at the same time propping up the PNP in their attempt to whitewash the Sagay massacre and not reveal who the real suspects are. The Unyon ng mga Manggagawa sa Agrikultura (UMA) today chided the Department of Agrarian Reform (DAR) for supposedly saying that there would be land distribution this coming March in Hacienda Luisita when what awaits the residents is their immediate eviction. DAR announced earlier that it will distribute to farmers the remaining portion of land undistributed in Hacienda Luisita, particularly in Barangay Bantog, and with President Duterte gracing the occasion. But, according to UMA’s Secretary General, John Milton Lozande said lands were already distributed during the time of then President Benigno S. Aquino III. What is certain though is that 800 families would be evicted in Barangay Central. The Central Azucarera de Tarlac (CAT), which is now owned by Martin Lorenzo together with the Cojuangcos and Aquinos had already filed a notice of eviction to the residents there on February 18, 2019. It stated that it already needed the said properties and gave those affected 60 days to vacate it and to demolish their dwellings and any other improvements in it. Failure to do so would compel the company to file legal cases against those who defy CAT’s wishes. A number of those residing in Brgy. Central have been living there for 50 years and many are mill workers of the CAT. Barangay Central’s Brgy. Capt., Jake Torres, acting on behalf of the Lorenzos-Aquinos-Cojuangcos, is offering each family P20,000 compensation if they would voluntarily vacate their homes and dismantle these. While it showed three land titles covering said area, in UMA’s own research, CAT has 373.909 hectares (has) of agricultural lands and another 382.5451 has under its subsidiary Luisita Land Corp. (LLC). Although in its latest annual financial report to the Securities and Exchange Commission, CAT only claims to have 48.6 has. of land not used for its business and operation. Most probably this is where the 800 families are to be evicted from. It also claims that LLC has only 202.19 has. Ayala Land Inc. bought 290 hectares of land in Barangay Central from CAT nearly a year ago, with DAR eerily silent with the sale. Instead of posturing for propaganda gains, the DAR should distribute 358.22 hectares of prime agricultural lands in Bgy. Balete and CutCut, owned and managed by Tarlac Development Corporation-Hacienda Luisita; the agricultural lands and undeveloped lands of LLC; and 384 hectares of land of Centenary Holidays Inc., Luisita Realty Corp., Lipco and RCBC. UMA would assist in anyway it could the residents, majority of whom oppose vacating and dismantling their homes in Hacienda Luisita. It is also calling on the general public to support the residents struggle against their eviction, expose President Duterte’s duplicity in supposedly promoting land reform while remaining silent in land grabbing in Hacienda Luisita. It seems CAT, its subsidiary company and TADECO of the Cojuangcos-Aquinos have also been emboldened by DAR’s new Administrative Order 1, which makes it easier for landlords to convert their lands for non-agricultural purposes and escape land reform. At the same time, the President issued Executive Order No. 75 that seeks to distribute only public lands while exempting private lands including those in Hacienda Luisita. There have been 13 massacres under the US-Duterte Regime. The most recent was the Sagay 9 massacre last October 20, 2018, which until now has not been brought to justice. Instead, the case was used by the Duterte administration to vilify and red-tag the National Federation of Sugarworkers (NFSW) and its members who survived the abhorrent massacre, while the military continues to harass and intimidate them and their family to keep them from seeking justice. But to whom can the victims of Duterte’s atrocities go when the highest court of the land affirmed the constitutionality of the third extension of Martial Law in Mindanao, while Negros, Bicol Region and Samar remained to be under a “state of emergency” through Memorandum Order 32. This has prompted huge deployment of military and police forces to these areas, specifically in Negros. On December 27, 2018, in a tokhang-style operation, state forces killed six individuals, some affiliated with KMP and PISTON; served arrest warrants to more than 50 people; and ransacked houses in several barangays in Guihulngan, Negros Oriental. In reality, the whole country is placed under a de-facto Martial Law as militarization intensifies in the countryside and political repression is pervasive among farmers, workers, urban poor, women, youth, church people, the media and other sectors. Just like Marcos, Duterte’s autocratic rule ensures that harsher measures to fully open the country’s economy to foreign monopoly and control are railroaded in Congress. This has led to further exploitation of workers and peasants as the US-Duterte is hellbent in maintaining the country in a semi-feudal semi-colonial state. On February 14, the Rice Tariffication Act was enacted, allowing unlimited rice importation. This will kill local rice producers who receive no subsidy nor support services from the government to compete with the low prices of rice imports that will flood local markets. Moreover, the government is seeking to liberalize the sugar industry and lift the quota of sugar importation under the guise of increasing its tariff to 30-40%. This is expected to totally eradicate what is left of the country’s sugar industry, displacing about 700,000 sugarworkers and more than 75,000 small planters, pushing more agriworkers into extreme poverty, debt and hunger. While the government eradicates rice and sugar production for domestic needs, the government pushes for aggressive expansion of agribusiness plantations that grow export crops such as Cavendish banana, pineapples, oil palm, and rubber, among others. Instead of strengthening its agricultural system which will serve as the foundation of its industrialization, the US-Duterte is fully intent on keeping the country’s economy import-dependent and export-oriented. On February 23, UMA will join other sectors in marching along EDSA to call for Duterte’s ouster. At the same time, it is calling on the people to join the national democratic struggle that would lead to structural changes, including the implementation of genuine agrarian reform and national industrialization. “Patuloy na ngang pinagkakaitan ng sariling lupa at nananatiling mababa at pakyawan ang sahod ng 700,000 manggagawa sa asukal, aalisan pa sila ng trabaho ng administrasyon na ito sa walang habas na pagpasok ng imported na asukal sa merkado,” said John Milton “Ka Butch” Lozande, secretary general of the Unyon ng mga Manggagawa sa Agrikultura. “Perhaps sugarworkers should remind the budget secretary that in 2017, the total value of its sugarcane production was at PHP43.9 billion and centrifugal sugar, one of the country’s top exports, was valued at USD203.55 million,” Lozande added. Despite the wealth created by sugarworkers, they continue to endure wages as low as PHP80-120/day due to piece-rate scheme; debt and starvation especially during Tiempo Muerto or off-milling season; and killings, threats and harassments when asserting their rights. They have been continually deprived of land with the prevalence of haciendas, especially in Negros, and denied employment benefits that should have been afforded to them as regular workers and supposed beneficiaries of the Social Amelioration Program. As Diokno pathetically tows the line of his lord and master, Duterte, he cannot help but contradict himself as what Duterte’s blind followers often find themselves in.